Lately, I’ve been looking at a few high magnification scopes and the primary reason for that was the fact that I was curious to see what is out there in the sub-$2K price range. I have long been a fan of Sightron SIII which sorta “brought high mag to the masses” and when they introduced a considerably more expensive SV 10-50×60, my curiosity was peaked. Then Vortex announced there Golden Eagle 15-60×52 and the guy sat Vortex said something along the lines of: “we know it is not your cup of tea, but we think you’ll be impressed”. Then I go to SHOT and stumble onto the Hawke Sidewinder ED 10-50×60, which is the subject of this article. It has an interesting feature where the turrets are removable and you can switch between mrad, and MOA clicks. I was curious enough to check it out. These are all priced a bit differently, so the comparison is not really apples-to-apples. Hence, while I will mention how I think these all stack up, in this article I will focus on the Hawke. Vortex and Sightron will be the subject of another piece. Before I continue, my assumption with all of the scopes that I tested is that they are all representative of their product lines and are not outliers of some sort. If they turn out to be outliers, I will procure another copy and retest (and update this article accordingly). It is the least expensive workable variable scope out there that takes you up to 50x. It stayed zeroed and adjusted accurately. 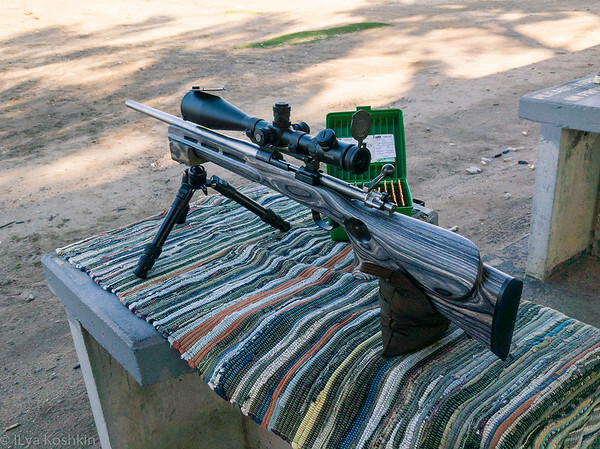 While advertised as able to focus at infinity, in practical terms, I could not get it parallax free beyond 400 yards or so, so it is not for people who shoot far away, nor does it have the adjustment range for that. The whole removable turret business is cute, but seems to be a solution looking for a problem. Still, if you like to switch between MOA and mrad adjustments for some reason, Hawke is the only game in town and it is a great marketing tool. Optically, it is a nice scope, but the Sightron SIII 10-50×60 looked better to me at high magnification for not a lot more money. They are not too far off from each other though. I do prefer Sightron turrets though. I liked the TMX reticle. It is a well conceived design. Who is it for? Hawke is a British company with roots in the airgun world. I think this scope is at its best for closer distance applications where you need the magnification to create very shallow depth of field, i.e. Field Target airgun competition. It works fine for target shooting within a couple of hundred yards with firearms, but there are better options for that, I think. As a general background statement of sorts, when we talk about variable high magnification scopes, the almost undisputed king of the hill there is March. However, March scopes are expensive. There are other contenders, of course, and they are pretty good, but March seems to rule the roost (I have not looked at everything in this market segment, so there may be something out there I am missing). If I were buying a target scope and had $3k or more to spend, I’d get a March be done with it. However, most of us do not have $3k to spare, so I was curious what else was out there. Yes, I have S&B and Kahles in the table above that are both interesting designs that bear further investigation, but from what I have seen so far, March is a better target scope and keeps improving (I really need to spend some time with the new High Master scopes). For the last few years, in the $1k range, there was Sightron SIII and not much else. There are some rather decent fixed power competition scopes from Leupold, Weaver and Nightforce, but for my use that is too restrictive. Hawke Sidewinder ED 10-50×60 undercuts Sightron SIII by a couple of hundred bucks and Sightron SV by a factor of two or so. As far as magnification per dollar goes, Hawke does well. Size-wise it is largely on par with the competition (it is a bit longer, but that is hardly an issue for this category). Notably, with close focus down to 10 yards, it does a bit better than most of its competition (although Sightron offers a separate Field Target version of SIII that focuses from 7 yards to 300 yards). Adjustment range for the Hawke is the lowest in this group and for its intended use, that is perfectly reasonable. Field of view is a bit wider than the competition, which is nice. As soon as you open the box, you immediately see the included sunshade (a necessity), large side focus wheel, focus locator (or at least that is what I call; that is the 30mm ring that is mounted on the scope tube and has a little sharp point sticking out. The only use for it that I can think of is to have it mounted so that the point tells you the exact position of the sidefocus wheel), and a couple of tools that make mounting the large sidefocus wheel and scope covers easier. The included rigid scope caps did not look terribly confidence inspiring, but held up quite nicely. I have a couple of scopes from another Chinese manufacturer and the scope caps on those seem to have a failure later of close to 50% (although the scopes themselves are pretty good). Hawke scope caps are very functional and can be rotated to open in any direction that suits you, which is a nice touch. As soon as I got the scope, I looked it over to make sure nothing is obviously falling off, rummaged around my workshop until I found a set of 30mm rings and headed to the range. For the firing portion of the test, I mounted the scope onto my 308Win Mauser. It is not a pretty looking rifle, since it was one of my original experiments in rifle building: I bought an intermediate Yugo Mauser action, a short chambered ER Shaw barrel and a Boyd’s stock. Once all that was in hand, I bought some tools and went to town on it. Miraculously, the rifle turned out to be fairly accurate and, similarly to most of my more recent and higher quality acquisitions, the limiting factor is probably not the gun, but rather the nut behind the bolt, so to speak. Honestly, the biggest reason I picked this rifle to do the testing was the simple fact that I ran out of taller rings and the Farrell base on the Mauser is pretty tall. The only unused rings I had at the moment were the inexpensive Weavers that were low in height. Since the Hawke has a 60mm objective lens, I needed a rifle with a tall base. Sighting in was rather uneventful. The scope I tested came with turrets that had 0.1 mrad clicks and the TMX reticle is mrad accurate at 20x. I set the target up at 50 yards, fired a shot, measured the offset with the reticle, adjusted to have the POI about half of an inch below center and fired another shot. Then, I moved the target over to 100 yards and fired a ten shot group to see if the scope is holding zero and to get a reasonable idea of where the centroid was. While the barrel was cooling off, I started getting early signs of odd parallax troubles. The range where I do most of my shooting has metal plates out to 600 yards, so I spent some time messing with the side focus knob at different distances. I could not get it to be parallax free at 600 for the life of me, so that made me pay attention. I carefully re-focused the eyepiece and experimented with parallax again. Same basic story: I can get the scope to be parallax free at 400 and closer. At 500, it is almost there, but not quite. At 600, parallax is obvious and I can not dial it out. I left it at that and did my usual tracking test for the elevation turret (I do not usually do much with the windage turret beyond making sure it does not affect the elevation adjustment). For this test, I fire a shot at a zero setting, then go up 1 mrad and fire a shot. Then back to zero for one shot and up 2 mrad for a shot. Then back to zero and so on. This takes a little time and ammo, but is worthwhile. The tracking seemed decent, but I did not test over a particularly large range of adjustment. With 3 mrad per turn and no zero stop, I am going to go out on a limb and say this was not designed to dial many turns. Besides, there were parallax issues at longer distances anyway. The turrets themselves are interesting. As I mentioned earlier, they come off which I found to be a little unnatural. I have seen scopes where after dialing your correction you can accidentally end up with the turret in your hand, detached from the scope. Usually, that is not a good thing. With the Hawke, you can do that by design. The threads that hold the turret to the scope are on the inside of that metal ring at the base of the turret. There is some spring tension involved, so mounting that turret back on without bungling up the threads took a little practice. At the top of the turret is the locking knob, so if you choose to have one or both turrets locked down for transportation or as a matter of preference, it is there. Given an opportunity, I usually lock the windage turret, which I did for most of the testing. The available turrets have 0.1 mrad or ¼ MOA or ⅛ MOA clicks. Best I can tell, whichever turrets you go with, you get 30 clicks per turn. The clicks are widely spaced and reasonably tactile. There is some slop in the turret, but it is well within one click, so it does not get in the way too much. I suspect the reason the clicks are so widely spaced is to allow for a tolerance build up that comes with removable turrets. The downside of that, is that competing designs offer quite a few more clicks per turn, which translates into either much finer granularity or greater adjustment in a single turn. For example, Hawke’s most direct competitor, SIghtron SIII, has 0.05 mrad clicks in a 2.5mrad per turn turret, which amounts to 50 clicks per turn. MOA version of the Sightron has 80 clicks per turn for ⅛ MOA turret or 40 clicks per turn for ¼ MOA turret. You can kinda pick your poison there and since the turrets are not interchangeable, the number of clicks per turn is different for different models. I am mostly a mrad user, so I stick with those versions. From that standpoint, while interchangeable turrets are a curiosity item for me, I can’t quite think of a situation where I would want to switch from mrad to MOA turrets. 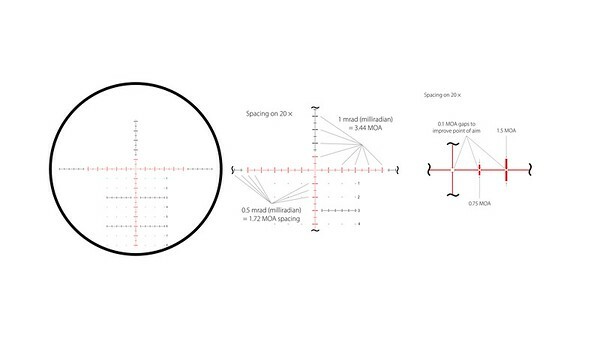 For someone who wants to use a TMX reticle interchangeable as mrad or MOA design at different magnifications, perhaps this makes sense. I spent a couple more days at the range with this scope sitting on the same rifle. Beyond the previously mentioned parallax concerns, there were no issues. The rest of the testing was done from my house’s upper deck. I have an old astronomy tripod base to which I hooked up a precision tilt stage from Newport. On top of the tilt stage is a picatinny rail, so I can mount a scope on it and check its adjustments against the tilt stages micrometer. The micrometer resolves down to ~0.01 mrad which is comfortably better than any riflescope I know of. 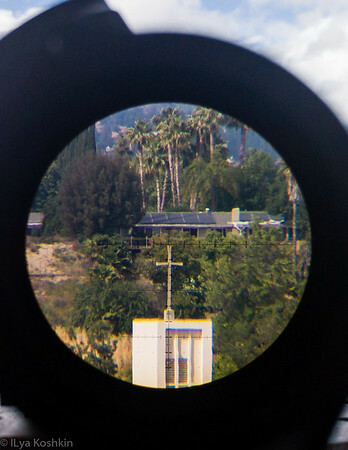 There is a catholic church a bit over 740 yards from my house and I frequently use the cross on the top of its tower as an aiming point (to add a disclaimer that should be obvious to anyone who has not gone to law school: when I am a riflescope at a church, it is not sitting on a gun. I do not aim guns at churches. 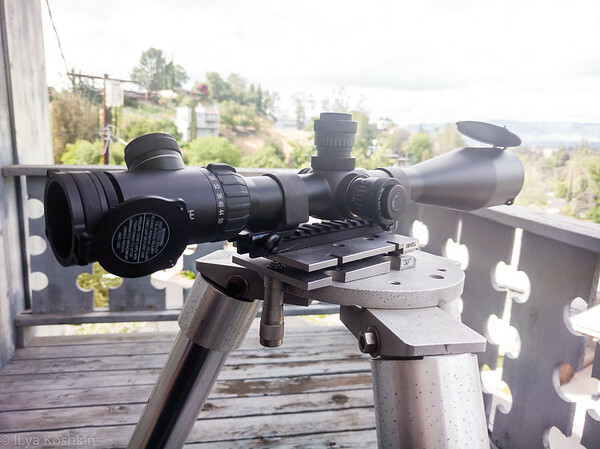 A riflescope is mounted directly onto a tripod for this as in the picture above). The house behind it is a bit over a mile away. In the case of the Hawke, since I could not dial out parallax at that distance, I had to look for something within a couple of hundred yards to do another tracking test. That tracking test worked well, but there was a slight amount of hysteresis in the adjustment turrets and in the sidefocus knob. 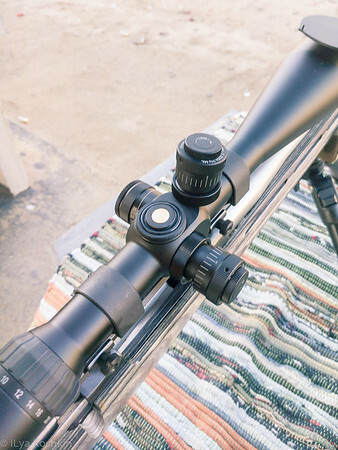 The reticle is a very thin design with a good variety of hold points without making it look like a mosquito net. The dimensions are accurate at 20x. 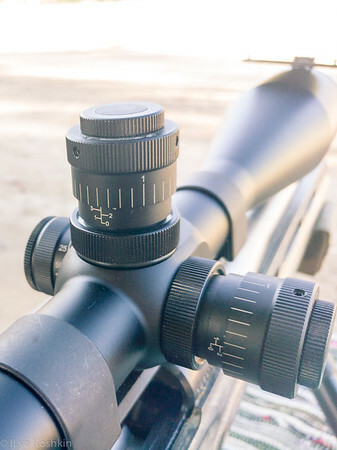 Since the reticle is in the second focal plane, you have to keep track of what magnification you are at. If you want to use this reticle as a MOA-accurate variant, you can calculate at which magnification you need to be and then verify it with field use. To map 0.5 mrad dimension into 1MOA, you need to be somewhere near 34x magnification. So this would be a situation where you want to have matching reticle and turrets at a higher mag: pop on your ⅛ MOA turrets and dial up to 34x or so. If this sounds like I am trying very hard to find a marginally viable use case for interchangeable turrets… well, that is exactly what I am doing and I am struggling with it a little. Reticle illumination while not strictly speaking a necessary feature for target shooting is a nice thing to have and Hawke’s implementation is done well. It is primarily designed to help in low light situations and can be set sufficiently low to not disturb your night vision. As far as optical quality goes, for the most part, I was fairly pleased with what this scope offers. I am pretty certain, that this is the best high magnification performance of any Chinese-made riflescopes I have seen to date. The image remains fairly clear out to about 35x or so. Going higher, you lose some image fidelity, but it is still reasonable. Chromatic aberration is kept under reasonable control (ED glass undoubtedly helps) and, in that regard, it is slightly better than the Sightron SIII, but slightly worse than Sightron SV. Where the Sidewinder ED struggles is with stray light control and that is the biggest reason why in terms of overall image quality, SIII edges ahead of it a little bit. The Hawke scope really benefitted from the sunshade. Most scopes do, but with Sidewinder ED, it was a pretty significant difference. When I tried a makeshift aperture reducer, the difference was even more drastic. Aside from that, the scope resolved well and maintained decent contrast through the lower half of the magnification range. Going higher in magnification started draining the image of color (this is likely related to stray light control I mentioned above). Low light performance was quite good as you would expect given a 60mm objective. Naturally, you have to keep it at the magnification level fairly low to get a reasonable exit pupil. Hawke ED maintained good contrast levels down into pretty low light levels, but once there were bright sources involved, it did not handle flare terribly well. There was some veiling flare which is pretty common with larger objective scopes, and other random stray light issues. Similarly to day light testing, reduced aperture helped with that, but reduced the exit pupil which is not great for low light. 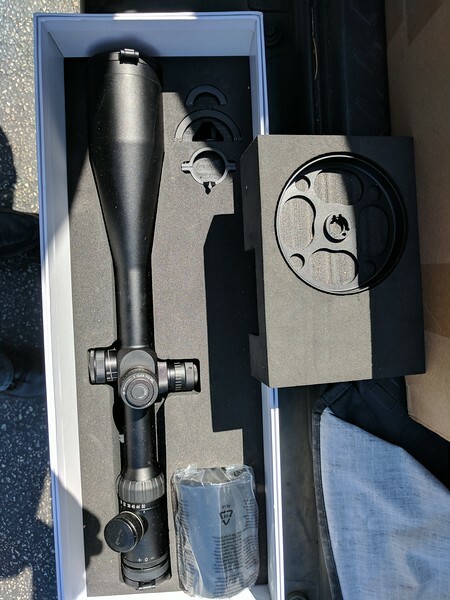 A final question to answer is pretty simple: given what is out there at the moment, would I buy this scope for my personal use? No, I would not. Would I recommend it to others? Yes, with a few disclaimers. This scope simply does not seem to be designed for my use case. I do not do short distance target shooting or Field Target. At longer distances, it simply does not work well due to limited adjustment range and parallax limitations. Besides, removable turrets, while cleverly done, do not do anything for me. Another thing to keep in mind is that if I were shopping for a high magnification scope, I would likely shop in a different price range. Had you asked me six months ago, I would have told you that ponying up for a March, while painful, is the only way to go. If someone asks me about a high magnification scope, March is still king, but for my money, I would likely get Vortex Golden Eagle. In the sub-$1k range, it comes down to Hawke and Sightron S3. Both have a lot to recommend them and, honestly, this level of performance at this price range in variable scopes would have been unthinkable just a few years ago. Lastly, if I were in hawke’s shoes, I would consider bundling an aperture reducer with this scope and looking into parallax issues. I think they can do quite well with centerfire shooters if they do that. Revisiting internal baffling may not be a bad idea either.